Ahh…..winter in Maine. 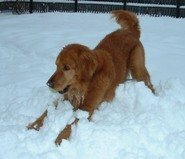 As a golden retriever originally from the south, you’d think I wouldn’t like the snow, but I love it! The only trouble I seem have with the snow is when dad and I play fetch. I live to chase balls you understand, so when dad throws a snowball for me and I get to the spot it landed and start to dig, I can’t ever seem to find the snowball. Oh well, it’s plenty of fun all the same. I don’t really feel so bad since my sister Java can’t seem to find them either and she likes to think she’s the smarter one.